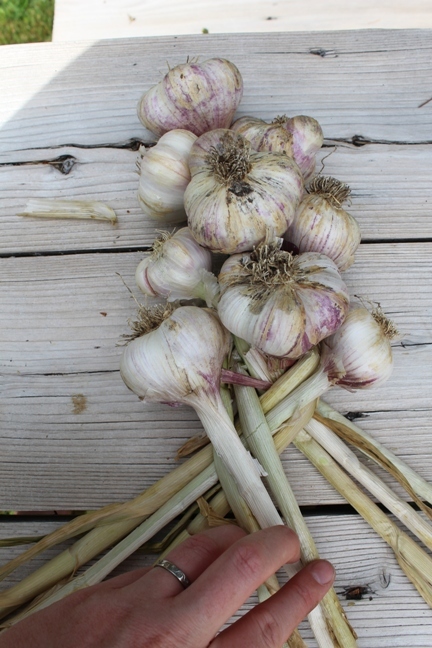 It’s late July and the garlic is ready! 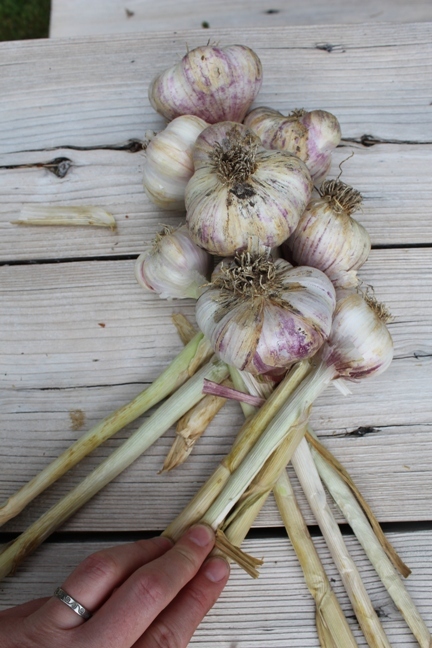 This year we devoted a whole bed and another half bed to growing garlic. We grew Inchelium Red (my favorite), and Nootka Rose; both are softneck varieties of PNW origin. Last year we didn’t grow nearly enough, and I kept giving it away– (much to DH’s chagrin); so, this year we vowed not to repeat our same follies. 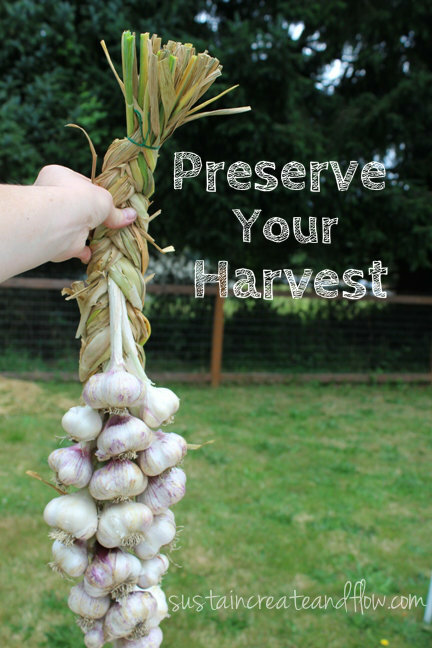 I did the math on our harvest, and we have enough to have a head of garlic every 2-3 days. 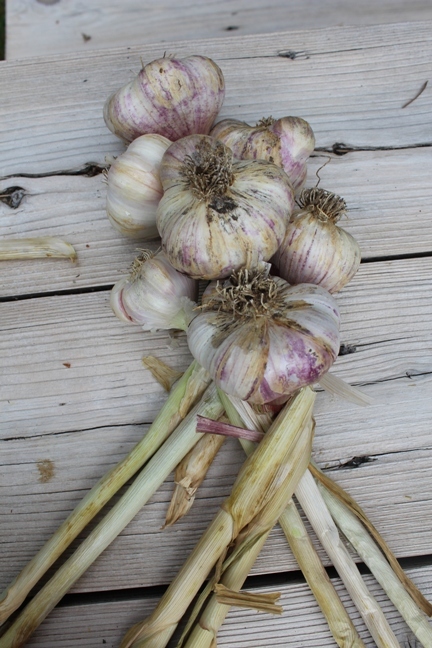 I did not factor in the garlic we need to save for next years planting, and all of the garlic we will use for medicine making. All things considered, we probably have half of that estimate, which is not nearly enough; but, better than last year! That is my main goal in gardening: learn from my mistakes and always be better than last year. First, dig all of your garden from your beds using a shovel. Take care not to strike the garlic. I have “shoveled” many a head, and the poor bulb comes out shaven and misshapen! Be careful with your precious garlic. If you’re like me, you don’t want to leave any behind! 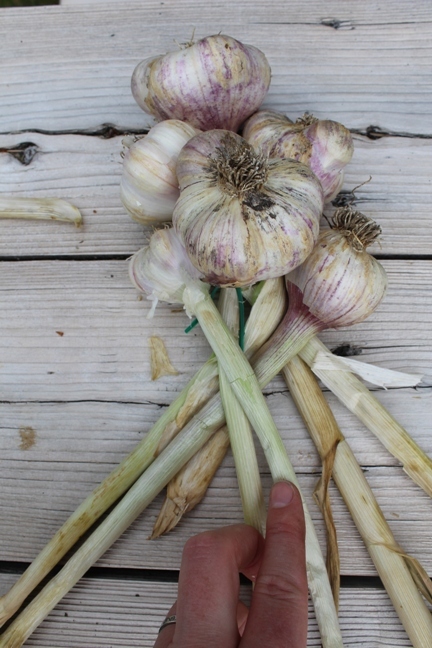 Allow your garlic to cure/dry for a while. I spread mine out on a board and let it sit in a dry place outside for about 5 days. Don’t skip this step, because if you braid it green, it may rot. It can cure the rest of the way once it’s braided, but also don’t let it get too dry and brittle, or it will be hard to braid. 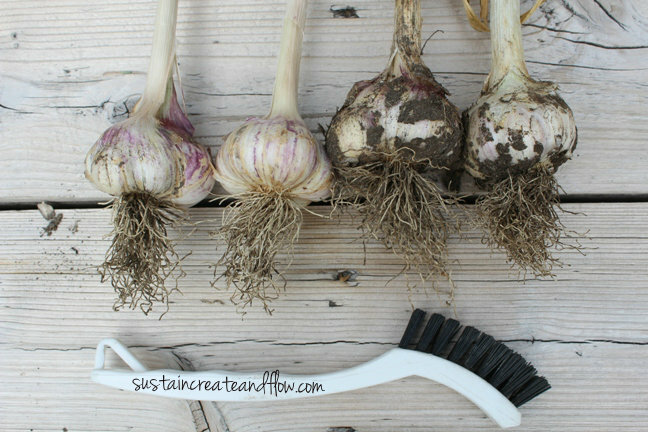 Next, once your garlic has dried a bit, using a small brush, gently clean the garlic heads. Remove all dirt and rocks and loose garlic skins. 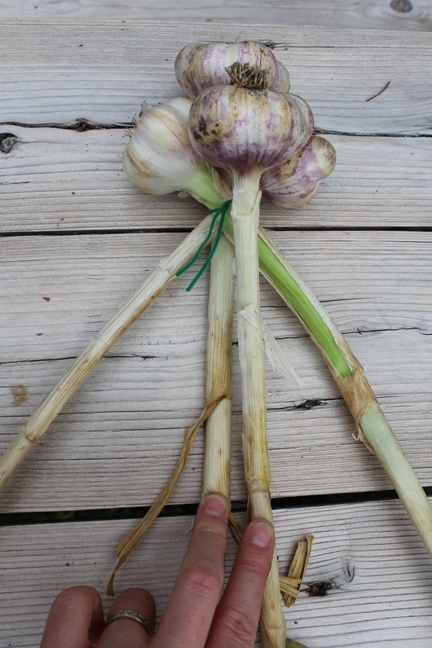 Take 3 heads of garlic and make an X over a central head as shown above. Secure the three with a twist tie. Don’t worry if the twistie looks pretty, you won’t see it later. I used larger heads of garlic for the center pieces. Notice that for this first initial set-up, I placed my center garlic head a little above the others. 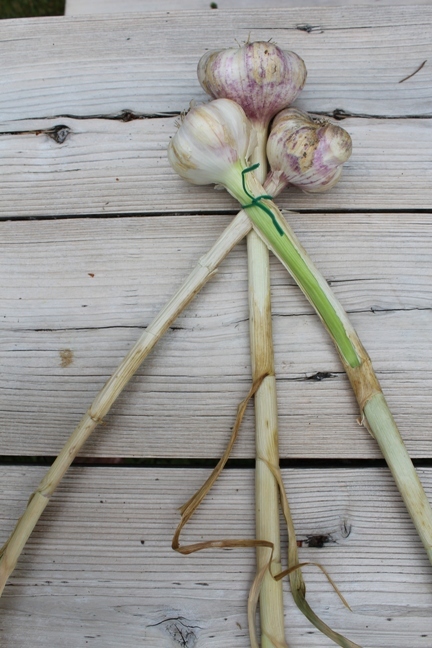 Place a head of garlic in the center position. 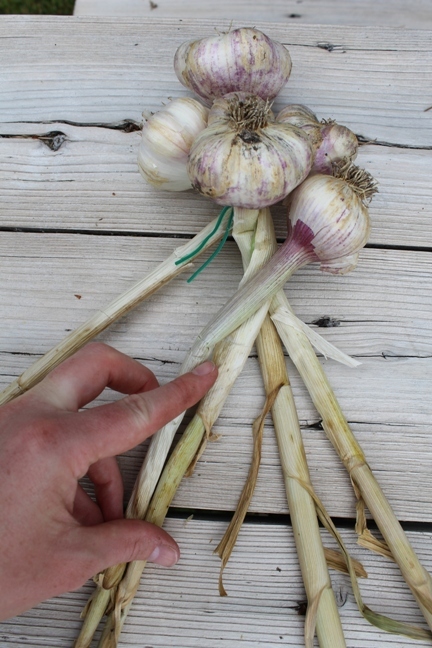 Make sure the “tail” (garlic stem) goes down the middle. The tail will always go down the middle of the braid. Cross over the center tails with the right tail. When you cross over with your outer tails, you only cross over one position to the center. 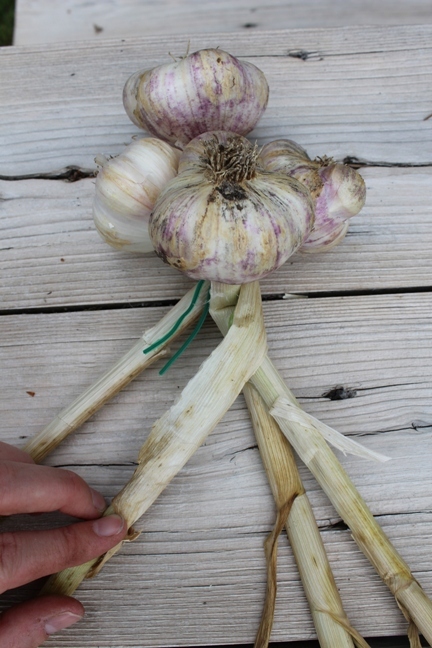 Add another head of garlic to the right position of the braid. Tail goes down the center. Look closely at the photo above. With the left tail, cross over the two center tails. With each additional head, just remember to cross with the tail you did not use last. Next, add a head of garlic to the left position. Tail goes down the center. Now all three positions have 2 tails. Take both of the tails on the ride side and cross over the center two tails. You have now completed one whole “row,” (for lack of a better description). Continue making “rows” until you have reached your desired length and shape. If you are making these as gifts, you may want to make smaller ones so you don’t give away too many heads of garlic at once. As you continue braiding, you will have more and more tails to work with. It becomes mildly difficult toward the end to wield them all, but it is manageable. Do the best you can with them to keep them straight and organized. 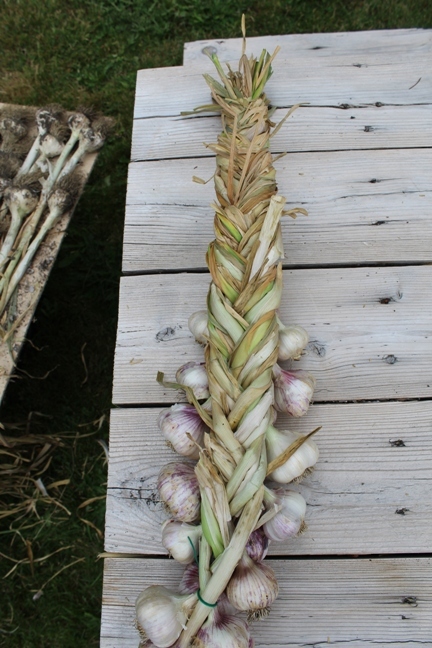 Once you have added all of the heads, braid the remaining tails into a standard braid as shown above. Secure with a rubber band, string, or more twist ties. Trim the ends to an even length. I finished my braids by tying on a decorative ribbon at the top of the braid. 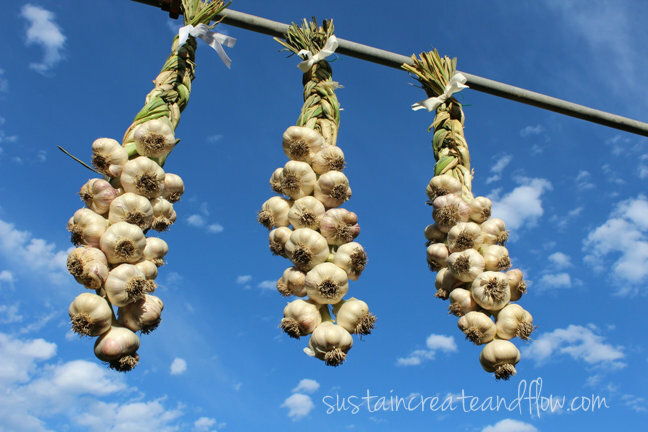 I braided, or plaited all of my garlic and hung them from a rack in the dining room. They are such an attractive decoration, I may not want to eat them! Here’s the view of the back of the braid. 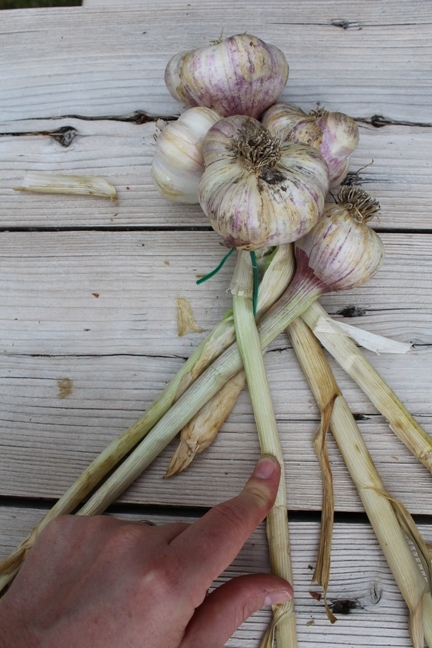 There are many different ways to braid garlic, and all are correct. Do what makes you happy. Go forth and plait. I’m silly enough not to have known that this was a preservation method and thought it was just a really cool decoration! HA! Thanks for continuing to enlighten me! !